Welcome to my first schedule analysis for the upcoming 2016 NFL season. That I'm starting these means the NBA and NHL seasons are winding down and we are entering the slow period of the NFL calendar. But it also means that training camps aren't too far off. Like last season, I will give early odds for each team's home and road schedules (all 32 road schedules up first) and try to provide some insight/betting history that might help you win a wager on said game. I'm starting with New England because of the whole Tom Brady situation. Of course you know by now that the U.S. Court of Appeals recently reinstated Brady's four-game "Deflategate" suspension. This fight isn't quite over yet as Brady and the NFLPA are still appealing that decision, but barring an unlikely en banc hearing by the Court of Appeals or the Supreme Court taking this case -- both considered highly unlikely -- then finally this silliness can end. Patriots fans believe that NFL commissioner Roger Goodell is out to get their team, but by the letter of the law in the collective bargaining agreement, Goodell had every right to make this decision. Is four games too many? No doubt. But the suspension should stand. The good news for New England, I suppose, is that Brady would miss only one road game. New England was 5-3 on the road last season, 3-5 against the spread and 5-3 "over/under." The Patriots face four winning teams and three playoff clubs from 2015 away from Foxboro this year, all of the postseason teams coming from outside the AFC East (Jets being the lone winning team not to make it). Sept. 11 at Cardinals (-5.5, 46.5): Sunday night game. Arizona was 6-2 at home last season and the Cards have an overall wins total of 9.5 at sportsbooks for this year. This line opened at a "pick'em" but then jumped when Brady's suspension was announced. Presumably this is the first career start then for Jimmy Garoppolo. I don't think it would shock people if this was a Super Bowl preview, and the Patriots get to see up close one of their former best defensive players in end Chandler Jones as he was traded to Arizona this offseason despite being one of the NFL's better pass-rushers. Why do that? The Patriots knew they couldn't afford him as a free agent following the 2016 season. This will be New England's first-ever regular-season game at University of Phoenix Stadium, although the Pats have been there twice for Super Bowls. 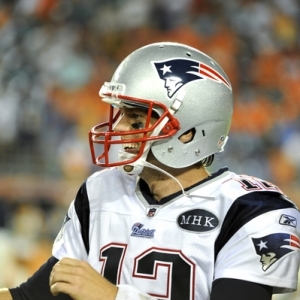 Key trend: Patriots are 7-3 ATS in their past 10 as a road dog. Oct. 9 at Browns (+7): Cleveland was 2-6 at home last season and has an overall wins total of 4.5, the lowest in the NFL. The Browns are off back-to-back road games at Miami and Washington ahead of this one. They probably are going to be 0-4. New England will have extra time to prepare as it's off a Week 3 Thursday home game vs. Houston. The big story line here is that it would be Brady's first game of the season if that suspension does stand. If New England is at least 2-2 entering this game, it should be fine to repeat as AFC East champion. But 1-3 could be tough. It's New England's first trip to Cleveland since 2010 and in that game, a Pats rookie tight end Rob Gronkowski muffed a kickoff that helped lead to a big Browns win. Key trend: Pats have covered only two of their past 10 as a road favorite of at least 7. Oct. 23 at Steelers (-1.5): Pittsburgh was 6-2 at home last year and has a 2016 overall wins total of 10.5, the same as New England. The Steelers enter off a Week 6 game in Miami and are ahead of their bye week, while the Pats are home to Cincinnati the previous Sunday. This is certainly one of the AFC's regular-season games of the year. It's New England's first trip to the Steel City since 2011, a 25-17 loss. The teams met in the NFL Kickoff Game in Foxboro last year and the Patriots won 28-21 behind 288 yards and four TDs from Brady -- three TDs to Gronkowski. Brady set a team record with 19 straight completions in the game. Key trend: Pats are 6-4 ATS in their past 10 at AFC North teams. Oct. 30 at Bills (+3): Buffalo was 5-3 at home last season and has a wins total of 8 for this year. The Bills are off a trip to Miami and then go to Seattle following this game. That's rough. This is ahead of New England's bye week. The Patriots won 40-32 in Buffalo in Week 2 last season. Brady threw for three touchdowns and 466 yards, the second-most in his career and most by any QB ever against Buffalo. Julian Edelman had 11 catches for 97 yards and two touchdowns. Key trend: Patriots are 5-5 ATS in past 10 road games before a bye week. Nov. 20 at 49ers (+6): San Francisco was 4-4 at home last season and has a 2016 wins total of 5.5. The 49ers are off a trip to Arizona in Week 10, while New England could be staring a trap game in the face as it's off a Sunday night home game vs. Seattle and ahead of a trip to the blood-rival Jets. Believe it or not, Brady has never played a regular-season game in San Francisco and he grew up not far from there. Key trend: Pats 5-5 ATS in past 10 at NFC West teams. Nov. 27 at Jets (+2.5): Sunday night game. New York was 6-2 at home last season and has a wins total of 8. The Jets catch a huge break here in that they are off their bye week. New England lost 26-20 in overtime at the Jets in Week 16 last year. You may remember that Bill Belichick chose to kickoff to start overtime instead of taking the ball and that hugely backfired as the Jets scored on that drive to end it. Brady hit James White for a 9-yard score with 1:55 to go, forcing OT. Key trend: Pats have failed to cover five of past six as road favorite in series. Dec. 18 at Broncos (+3): Denver was 6-2 at home last season and has a wins total of 9. The Broncos are off a trip to Tennessee in Week 14, while New England is on a short week, hosting Baltimore on the previous Monday night. Of course the Patriots were 0-2 in Denver -- a city Brady never plays well in -- last season, losing 30-24 in OT in Week 12 (with Brock Osweiler as QB) and then 20-18 in the AFC title game. The latter proved to be the final Brady-Peyton Manning showdown. Who knows whom Denver's QB will be by this point in the season? Key trend: Pats 3-7 ATS in their past 10 in Denver (playoffs included). Jan. 1 at Dolphins (TBA): As usual, no lines for Week 17 because too much could be at stake -- or nothing. Miami was 3-5 at home last season and has a wins total of 7. The Fins are off a Week 16 trip to Buffalo, while New England hosts the Jets the previous Sunday. It's the second year in a row New England closes in south Florida and it lost there 20-10 in 2015 to cost the Pats the top seed in the AFC playoffs. Brady was held to a season-low 134 yards and without a TD pass for the only time last year. He threw only five passes in the first half, the lowest halftime total in any game he has ever started. Key trend: Pats 0-3 ATS in past three trips to Miami.